Here's a little something about me - I absolutely love getting the mail! Weird, right? I love getting magazines and catalogs even if they just pile up for weeks until I have time to read them. I mean, obviously I don't like the bills (sometimes I just put them back for the next day...ha), but sometimes I get a handwritten note from my grandmother or a fabulous invitation like I did yesterday.! Stu and I are heading to Steamboat Springs, Colorado in July for a good friends wedding, and if their handmade invitations are any indication, the wedding will be stylin! Can you believe the couple made these invites by hand? Hand stamped, printed out on their home computer, supplies all bought from the AMAZING, DROOL-WORTHY Paper Source! Take a look! Look at the hand stamped hearts - I'm obsessed! You can't tell how great the paper is over the computer (Duh Jackie), but the paper is super thick and wonderful - love love love. 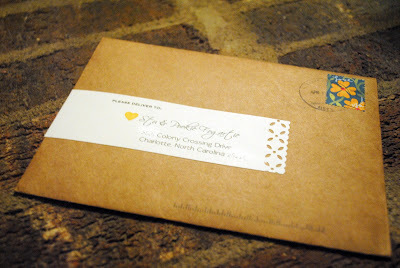 The little yellow piece of paper has their wedding website on it, I think it's a great touch! I loved getting these handmade invites in the mail. If you can't find your perfect wedding invite, think about making them yourselves! Congratulations to Annie and James and I can't WAIT to see what kinds of handmade touches your wedding has! Those are beautiful! Loving the yellow...and the hearts. Remember to take lots of pictures to share! I love getting personalize letters form my friends that took the time to show me how much the care.